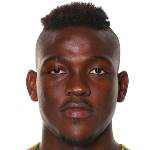 Ghana defender Daniel Opare has reiterated his desire to play in the English Premier League despite signing for Belgian side Royal Antwerp in the summer transfer window. The former Real Madrid defender, who joined Royal Antwerp from Augsburg, following a frosty end to his stay in Germany believes joining the Belgians will provide him with the platform to rediscover his form. Opare had an excellent first half to last seasons Bundesliga but was relegated to the bench in the second round after forcing a move away from the club. Schalke O4 and relegated English Premier League side Stoke City were close to securing his signature during the winter transfer window, however the deal fell through. Daniel Opare revealed how excited he was, when Royal Antwerp inquired about his services and admits he will help the club realize their goals. "When Luciano D'Onofrio phoned me and told me about the Antwerp project, I was immediately enthusiastic. Look at the stadium, the training infrastructure. Okay, it's a different level than in Germany, for example, but it's great," he said. "Together with the club, I want to develop myself further, I want to get along, prove myself and then probably leave, that's how it goes in today's football. The Premier League remains a dream," he added. The 27 year old has a positive start to the season in Belgian after helping Antwerp to victory on match day 1 against Charleroi. He is also featured in his side draw against KV Kortrijk.